Information about updated toys sections, and newly added toy sections for 2014. Below are links to all other years updates. I have just finished updating the whole FairyWinklessection to include larger images, more information about the UK releases, and Euro line �Folly Magic�. I�ve even found some commercials! By comparing the fronts and backs of all the packaging I�ve been able to find, I have been able to group the line into two distinct series. Series 1 US packaging are all dated 1993, and UK/Euro packaging are all dated 1994. Series 2 US packaging is dated both 1993 and 1994. I�ve not found any images of the UK/Euro series 2 back packaging for a date, but it may have been released 1995. Images of series 2 US packaging is hard to find, Euro packaging is even harder, and UK packaging impossible! I�ve just added several publicity shots and a few newly discovered dolls to the Secret Beauties section! I can now confirm there were six dolls in each set, four white and two black, most of which there are now images of. I�ve also added a new page for unproduced dolls and playsets. There were twelve new dolls due for release in 1993 which never made it to the shops, plus a playset and four refill sets. I�ve just added a toy section for�Hatchlings! They were produced by Russ in 1994 and were a series of six troll-looking dinosaurs. There don�t appear to have been any other related items sold. I�ve just added a new section for�Girl Talk! Girl Talk was produced by Golden in 1988-93 and were a selection of games for girls all about dating and boys! There was also a series of books and some electrical items too. The original game was also re-designed by Milton Bradley in 1995, as well as versions by Waddingtons for UK (1988), XF Schmid for Germany (1991) and even a PC game. I�ve just added a new section for�Fuzzy Felt! Fuzzy Felt was produced by Allan Industries from 1950 onwards and were felt shapes which clung to a fuzzy board for endless picture variations. They reached their height of popularity in the 1970�s and are still going strong today. Last May, I fancied adding something a little different into my website, so went for that British favourite; Fuzzy Felt! Little did I realise how long it had been going for or how many different sets had been released since 1950. And then came the box variations, company changes and current incarnations! What I thought would be nice and easy to research began to take longer and longer, taking 18 months (on and off) from the point when I first scanned my own boxes and leaflets, to just uploading the finished pages today. I�m still finding box variations and missed playsets, and probably will for some time as they pop up on the second hand market. I�ve just added a new page for Teeny Teens! They were produced by Imaginations in 1988 and were a small series of little teenage dolls with long hair for styling. They are very hard to find. I�ve just added a new toy section for Shampoodle! Shampoodle was produced by Hasbro in 1991 and was a rubber poodle bath toy that you filled with shampoo. When squeezed, the shampoo would come foaming out of its head for foamy hairstyling fun. 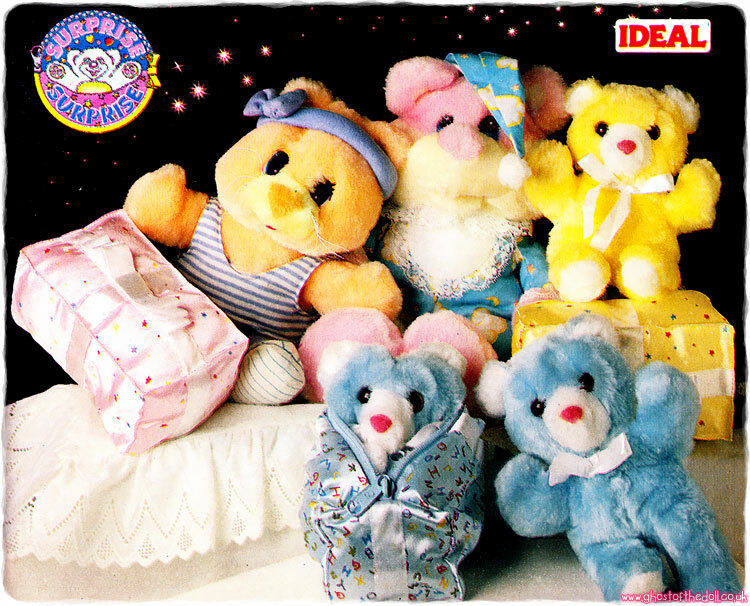 I�ve just added an image which includes all four of the CuddleBrite plush dogs. I�ve also added a close up image of the collar tag. I�ve just updated several images and added a few new dolls in the My Pretty Mermaids section! I�ve now found images of three of the four black dolls from the Original series, an image of Star Blossom from the Moonglow series (still need to find Moon Shadow) and packaging images of the Sea Dreams Waterbed playset. Several of the current images have also been updated. I�ve just updated the whole Miss Party Surprise section with lots of new, clearer images and extra information. I�ve also found a couple of TV adverts. Most interesting though was finding that six more dolls were produced in 2002 (still by ToyBiz) re-using skirt moulds from the original series, as well as accessories from all over the line. Here�s one example of the original release Princess Party�and the second release Pretty Princess playsets. I�ve just added and updated several images and pieces of information in the Darlin� Dinos section! Larger images of the Snazzies, plus a colour variation found. Two more Dressy Dinos found, plus some larger images added. One more Bendable Dino found (green). Larger images added of the Movers Groovers, plus packaging variation images. One more Sweet and Lovely found (blue), plus larger images added. Larger image added of Dino Babies, plus extra packaging image showing they were sold individually, as well as in pairs. One new Clip-On dino found (green). An unknown glittery red dino found. Extra packaging image of the Lil Dinos showing they were sold individually, as well as in pairs and trios. Mini Dino set of twelve added. Six different Fun Rings added. Images of two Pencil Toppers added. I�ve just updated all the images in the Princess Magic Touch section! All dolls and playsets now have larger images with clearer descriptions of their accessories. Many images are thanks to Prancetron! I�ve just added a new section for Snuggle Baby! Snuggle Baby were produced by Mattel in 1983 and were a line of four 13? baby dolls with blanket soft bodies. Their bonnets were attached to their heads, which were the only plastic part to the doll. The whole doll was machine washable. I have finally discovered the names of the last two Wing Dings, thanks to a Hasbro catalogue scan by Prancetron! They are called Wisp�and Glider. I�ve just added a new section for Life Savers! Life Savers were produced by Remco in 1981-82 and were a small line of scented poseable 6? dolls and 2.5? miniatures based on the long established US Life Savers candy. Life Savers candy came in five flavours (cherry, lemon, lime, orange and pineapple). The dolls used two of these scents (lemon and cherry) plus two others (tutti-fruitti and mint). All four dolls were produced as scented 2.5? miniatures too. New image and information have been added to the Little Beauties section! I�ve just found another Carousel Pony hair colour variation (purple body with pink hair), plus an image of the purple Beachtime Baby Twins (only the blue Partytime twin is missing now). I�ve also added images of the production ponies next to their Prototypes for comparison, and in doing so realised that the two ponies I was unsure of are in actual fact painted-up prototype Nite Star�s (not sure why I didn�t spot this before!). The Nite Star prototype is the only one which differs slightly from her production version. I�ve just added some new images and information about the small Glow Boglins as it now appears that all six of the Small Boglins were produced as Glow Boglins and possibly all three Euro long tongued variations too! I�ve also tried to clarify the name variations and swap overs of these little guys, as it was quite confusing at first! I�ve just added several new images to the Lots-a-Lots-a-Leggggggs section! This includes 7 new toys on the �Original� page (including the 100 legged one below), 14 new toys on the �Characters� page, 5 new toys on the �Reissues� page plus 8 new items on the �Accessories� page. Phew! A big thanks to Sara for many of these new images! I�ve just added lots of new images and information to the Fluppy Dogs section! Clearer images of all the dogs and puppies have been added, along with their accessories and packaging. A new page has been added for the unproduced �Flash Flups� and �Puppy Twins� lines, as shown in a 1987 catalogue. Several new book images have also been added, as well as a few other merchandise items. I�ve just updated the Boglins page having�just discovered a second Light and Sound Boglin, aka Talking Boglin (thanks to Ryan for sending me these images). I�ve just added a new toy section for�Dream Bears! They were produced by Remco in 1984 on the back of the Care Bears success. They were a small series of six poseable bears wearing moulded vests, plus eight fashion outfits. I�ve just added a new section for�Shaggy Doggy Mommy! They were produced by M-Toys in 1987. They were a small set of yarn haired, plastic dogs and puppies blatantly based on Fluppy Dogs (which they are often mistaken for), and squeaked when squeezed. The toys had no manufacturers marks. I�ve just added a new section for�Lots-a-Lots-a-Leggggggs! They were produced by Commonwealth in 1984, and again in 1998. They were colourful, plush caterpillars with a multitude of legs, wearing multi-coloured socks with sneaker-printed feet. In Greece they were called Trexalitsa and produced by El Greco, in Italy they were called Mille Pa-Pattttttes and produced by Gig and in France they were called Tante Tante Gambe and produced by Ideal. Just like their name, there were lots and lots and lots of them! I�ve tried to add as many colour and size variations as I can find for both the original 1980�s release as well as the 1990�s reissues. New images and information have been added to the Glo Pals section! Quite by chance, whilst searching the internet to help ID a Lanard dolls dress, I came across a sale for Cubby Curls. It appears Lanard repackaged and renamed their left over Glo-Pals from 1994 and as Cubby Curls with new accessories in 1997. I don�t know why they went for �cubby� as they were far more cat-like! Without finding more packaging images there is no way to know for sure if the colourings were the same from one set to another, but I suspect that was the case. One strong indicator of this is that the packaged stripy �Cubby Curls� was also illustrated on the �Glo-Pals� packaging. New and updated images have been added to the Dreamie Sweets section! Loose images of Goody Dreams and Shiney Dreams have been added, along with a larger box back image and all dolls in their packaging. I still have yet to find an image of the pony DreamDancer in loose or boxed form, but the new packaging image shows it much clearer now. New images and updated information has been added to the Little Pretty page! Loose image of all playsets as well as packaging images have been added (where found), which shows the differences between what was actually sold and the publicity images made pre-sale by Mattel. Deluxe Pet Carrier is now known to have actually been called�Beauty City. Cologne Gift Set was actually called Perfume Kitties Gift Set. New images have been added to the Tea Bunnies section! It has now been confirmed that there were at least five Soft Tea Cup & Saucer Sets produced. Candy Violet was already known and pictured, images of Rose Bonnet and Tulip Blossom have been added with Bouncy Boxwood and Petunia Petal yet to find. New images have been added to Yum Yums! An image of�Gigglin Gumball Mouse has (finally) been added, along with larger images of all other Yum Yums and accessories. Packaging images have been added where found. A page for the Japanese Reissues has also been added with images of the plush toys and mention of all the extra merchandise produced. I�ve just added a new toy section for Furby! Furby were produced by Tiger Electronics from 1998 to 2002. They were a line of furry, interactive electronic creatures which looked a bit like owls and were the �must-have toy� of Christmas 1998. Hasbro re-designed the line in 2005-2007 but without any great success, and then again in 2012. 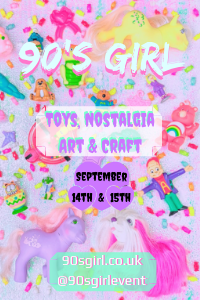 There were adults, babies and buddies, fast food toys, limited editions and various friends produced making it quite a collection! I�ve just added a new�toys section for Charmin� Farm Friends! They were produced by Meritus in 1993-94, and was a very small series of four flocked poseable barnyard animals and little figures. There were four Fuzzimals produced (pig, cow, lamb and pony), but seem to have been colour variations too. They had flocked bodies and brushable hair in non-realistic colours, and had jointed legs and head. Each one had a molded on neck scarf and came with a comb. They also had gems either on their scarves or under their ears. The four characters were also produced as small figurines called Barnimals (of which at least eight were made). They measured about 6cm, had brushable hair and came with a comb (same one which came with the Fuzzimals). They were sold in a four-pack, but also look to have been sold individually. They were very similar to Darlin Dino mini figures (also produced by Meritus).